After last week’s class on the Vancouver punk community, we thought it might be fun to start posting our ideas on what we covered in class online, so we can keep pushing those intellectual boundaries even after the bell rings. And if you missed the class, well here’s your chance to throw in your 2 cents (or profound ideas)! In the late-1970s and early 1980s, the Vancouver punk scene was a vibrant and diverse community. 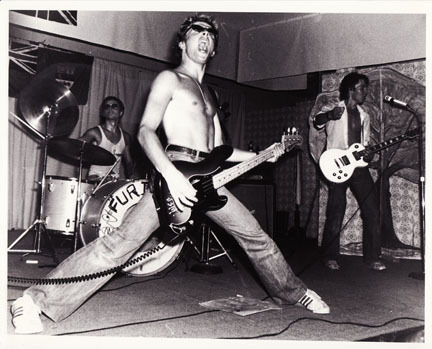 We’ll look at originators like Joey “Shithead” Keithley, his group DOA, and another local band called The Subhumans. Gerry “Useless” Hannah, The Subhuman’s bass player, was a member of the activist group Direct Action. These dissenters were arrested by the RCMP for attacks against property, which sparked a media firestorm. We’ll also discuss Vancouver participants in relation to the wider punk milieu, and the 1980s’ counterculture as a whole. The Philosophy of Punk, pp. 112-114. Hannah’s Maximum Rocknroll column, 1984. Toronto Star, 15 October 1982, p. A3.